Biotinylated Human IL-17 RA, His Tag (ILR-H82E5) is expressed from human 293 cells (HEK293). It contains AA Leu 33 - Trp 320 (Accession # Q96F46-1). The protein has a calculated MW of 37.2 kDa. The protein migrates as 55-68 kDa under reducing (R) condition (SDS-PAGE) due to glycosylation. 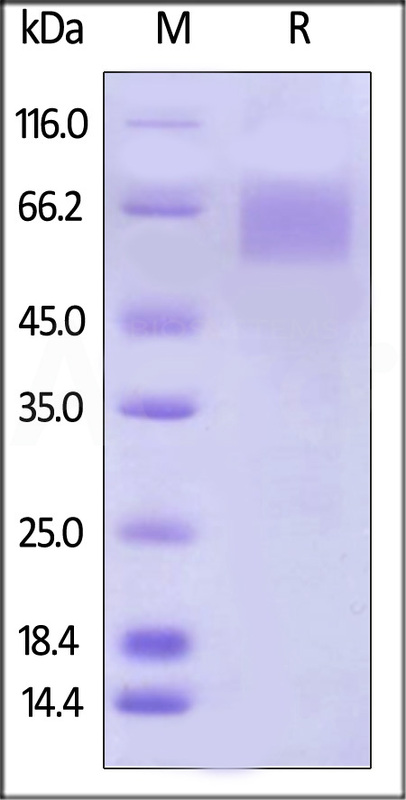 Biotinylated Human IL-17 RA, His Tag on SDS-PAGE under reducing (R) condition. The gel was stained overnight with Coomassie Blue. The purity of the protein is greater than 90%. Immobilized Human IL-17A, Tag Free (Cat. No. 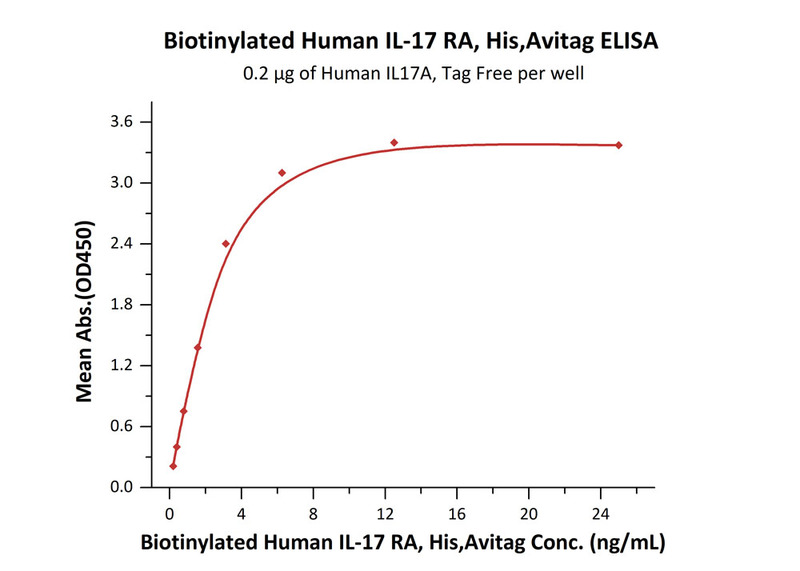 ILA-H5118) at 2 μg/mL (100 μL/well) can bind Biotinylated Human IL-17 RA, His Tag, Avi Tag (Cat. No. ILR-H82E5) with a linear range of 0.2-8 ng/mL (QC tested). Interleukin-7 receptor subunit alpha (IL-7 RA or IL7Ra) is also known as cluster of differentiation 127 (CD127). IL-7 RA is a type I cytokine receptor and is a subunit of the functional Interleukin-7 receptor and thymic stromal lymphopoietin (TSLP) receptors. IL-7 RA has been shown to play a critical role in the development of immune cells called lymphocytes - specifically in a process known as V(D)J recombination. This protein is also found to control the accessibility of a region of the genome that contains the T-cell receptor gamma gene, by STAT5 and histone acetylation. (1) Sanyal M., et al., 2015, Clin Immunol., 161 (2): 355-365. (2) Goodwin RG., et al., 1990, Cell, 60 (6): 941-951. (3) Zenatti PP., et al., 2011, Nature Genetics, 43 (10): 932-939.